Miss my previous review? You can find it here! Episode 6 ended with Rimuru and Shizu getting to spend some quality time together, and yet, the masked hero is tormented by dreams of turning on her friends. Desperate to spare her friends from any danger, she’s preparing to leave the Goblin settlement when she’s overcome by the spirit of Ifrit. In her new form, Ellen, Gida and Kabaru are shocked to discover Shizu’s true identity: the legendary Conqueror of Flames – a hero of legend that’s rumored to have tremendous power! Rimuru and the others recognize that she’s obviously possessed and being used against her will, and so they go to war with the demon to free their friend. Ifrit’s extreme heat nullifies Rimuru’s typical water-based attacks, and so he asks Ellen to hit him with an ice missile spell so that he can add it to his skill-set. The ice missile soon becomes an “ice-shotgun” attack, taking out the winged demons that Ifrit had summoned, as well as body-doubles that Ifrit used to try and surround and overwhelm the slime. Rimuru appears to have the upper hand with his newfound skill, but just as he’s about to attack, he activates a powerful glyph from Ifrit, triggering an intense tornado of flame that seems to spell doom for our friendly neighborhood slime! That is…until he realizes that he’s immune to fire damage. Emboldened, Rimuru captures Ifrit in his steel webs and finishes the fight off by consuming the demon with his Predator skill. Shizu is left in the aftermath, seemingly freed from the demon. Ifrit, meanwhile, finds himself at odds with Veldora within Rimuru’s vast stomach. Following the battle, Shizu is drained, and seems to be on the brink of death. She asks Rimuru to listen to her story, to know that she lived, and tried to do good for the world. Shizu shares her story: how she served as a close aide for a Demon Lord named Leon Cromwell – the same man who summoned her from Japan over 50 years prior. She confesses that she once killed one of her dearest friends due to her possession by Ifrit, and after encountering a mysterious masked hero, resolved to turn her life around. After traveling and training with the hero, they eventually parted ways, inspiring Shizu to grow even stronger. She ran a school for others who were teleported from another world – children who needed a place to belong. Despite her good works, she was still torn by guilt surrounding her years under the Demon Lord’s employ. She sought him out, hoping to get an answer surrounding the displaced kids she had helped to teach and raise. She wanted to know if there was a chance for them to be returned home, and to acknowledge that there was still a human within her that was worth recognizing. Despite her youthful appearance, Shizu had spent quite a number of years battling evil, and so her time was coming to its natural end. As a heartbreaking final request, she asks Rimuru if he would consume her with his Predator skill so that she could “rest within him”. 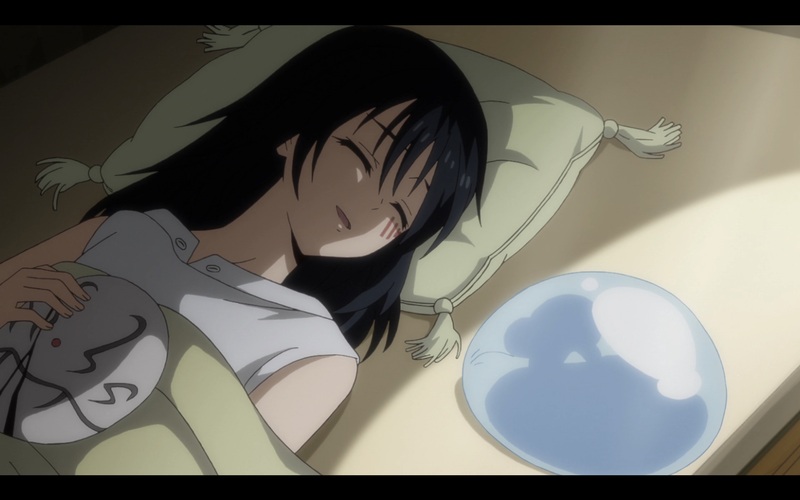 Rimuru agrees, and as Shizu’s hair goes to white and she passes peacefully in her sleep, he activates the Predator ability, hoping that she only has good dreams during her eternal rest. Within his stomach, Shizu comes to consciousness and embraces her long-lost Mother. Back at the Goblin Village, Ellen, Gida and Kabaru go looking for Shizu, only to discover a strangely familiar person (?) lingering in the tent. Rimuru uses Shizu’s consumed form to take a humanoid shape for the first time since arriving in this fantastical world. He demonstrates that he’s still Rimuru, and that he’s able to freely switch between his humanoid and slime forms. The trio of adventurers that arrived with Shizu grieve in their own way over their lost friend. They ask Rimuru to turn into his human form and each take turns thanking “Shizu” for mentoring them and making them into better heroes. As a parting gift, Rimuru has Kaijin and the dwarves craft them some premium-grade equipment before setting out on the road again. In the closing scene, Rimuru reflects on Shizu’s life, recapping that she may have started her life in this world working for evil forces, but her perseverance and dedication to preserving peace and happiness as the Conqueror of Flames will be her eternal legacy. His new mission is to find the demon lord Leon Cromwell and take him to task for making Shizu cry. Rimuru does some experimenting with his new human form, celebrating the fact that he can now taste things (!!! ), he also discovers that his default form is sexless, but he can manipulate a body double into masculine or feminine forms. The Goblin Village is making great progress, even after Ifrit’s sudden fiery attack destroyed a good portion of the nascent town. Things seem to be going swimmingly until Rigur and the others are set upon by a party of Ogres during a supply run. Ranga telepathically calls for Rimuru – who rushes to the scene. The Ogres are not quite what you’d expect in a fantasy world: rather than monstrous, foul beasts, they are humanoid in size and shape. Coming onto the scene, a handful of goblins are on the ground – forced to sleep by magical means. Rimuru, ever the cool-headed Gary Stu, asks to clear up any misconceptions and bring the battle to an end. The main Ogre, who we’ll just call “Red Leader”, refuses to negotiate with an evil “majin”, seemingly on a mission of revenge. Realizing that the negotiations are going nowhere, Rimuru goes into action, taking down three of their party in a flash while Ranga keeps their caster occupied. Red Leader is frustrated, but flanked by a more seasoned Ogre who possesses some seriously impressive sword-skills. In a flash, he nearly takes off Rimuru’s head, instead slicing off the slime’s arm in a surprise attack. Thinking they got the upper hand, Rimuru showcases more of his ridiculously overpowered skills as he regenerates his arm in a flash, then takes Red Leader’s “Ogre Flame” attack effortlessly. Finally, Rimuru decides to get “serious”, removing his mask and showcasing his terrible aura. He uses his recently acquired “Degeneration” skill to produce a tremendously powerful black flame, giving the standing Ogres pause as he offers a ceasefire once again. Red Leader is prepared to die fighting before the pink Ogre steps in front of him. She is certain that Rimuru wasn’t involved with the attack on their village, and as the group slows down and finally starts talking, the misunderstanding crystallizes. Red Leader apologizes, but in typical fashion, Rimuru responds to the attack by inviting them back to the village to enjoy the grand feast they have planned, and so he can listen to their story. *sniffle* Just when you think you’ve got a handle on this show, it just has to go and deliver a gem like episode 8. Despite being a bit rushed at points, the Shizu arc ultimately wrapped up masterfully, with an impactful goodbye to a character that will no doubt shape our protagonists actions for many episodes to come. We’re familiar with redemption stories, but what makes Shizu’s narrative even more engaging is the various plot threads that are tied so closely into her background. There’s suggestion of being able to return to one’s previous world, the mysterious Hero that defeated Veldora serving as her mentor, and of course, her service to a Demon Lord. I’m certainly interested in seeing these different storylines unpacked in time. The highlight was definitely seeing Rimuru putting his sampling of skills to work in dismantling the attacking Ogre party. His increasing confidence surrounding his powers is exciting to see as a viewer. It did strike me that he’s not so much of an intellectual or strategic MC as he is overwhelmingly powerful. Sure, he has the sense to learn ice skills to put down a fire demon, but we’re not exactly talking Lelouch-levels of scheming here, and honestly that’s okay. It plays into the simpler storytelling: an overpowered hero finding friends and disarming enemies with his charm, ridiculous power, or both. The animation runs the gamut, with crisp action sequences punctured with some less-than-flattering filler scenes. Overall, however, it maintains the quality of a top-tier show for the season, with some great character design and landscape shots throughout. That Time I Got Reincarnated As A Slime maintains its spot as one of my favorite this season – and for good reason. Time to find out what all the fuss is about with the Ogres in episode 10!